Aquilla Flood, a 17-year-old high school senior who was recently voted prom queen by her class, was shot and killed in her home June 5. 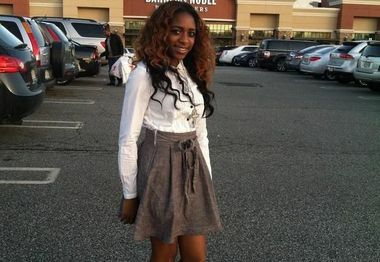 Prosecutors have charged 18-year-old Almuqqadin Means, who students described as Flood's ex-boyfriend, with her murder. EAST ORANGE — The East Orange City Council is slated to vote on a resolution next week to implement anti-domestic violence measures in the city. The resolution, sponsored by the local group East Orange Citizens United For Change, was spurred by the June 5 slaying of Aquilla Flood, a 17-year-old East Orange Campus High student who was allegedly shot by her ex-boyfriend. After her death, family members said they learned that 18-year-old Muqqadin Means had been threatening Flood. The Aquilla Flood Domestic Violence Act would require the East Orange School District to adopt a comprehensive domestic violence curriculum for students in grades 6 to 12 beginning in Fall 2014, according to Tomecca Keyes, president and co-founder of East Orange Citizens United For Change. “This preventive measure will provide a structured framework for addressing the relationship health of our students and begin to destroy the culture of abuse rapidly developing in our community,” the advocacy group said in a statement. The task force, the group says, will also serve as a think tank for new ideas and raise funds to host community forums, summits and anti-domestic violence campaigns. Flood had plans to attend Centenary College and was set to graduate high school within a week when she was found shot to death in her bedroom, authorities say. Means was arrested after a weeklong manhunt and has pleaded not guilty to murder charges. "In the same month of her death, Aquilla’s classmates voted for her to be prom queen and now East Orange Citizens United for Change is asking the City Council to vote to honor her memory by making the Aquilla Flood Domestic Violence Act a reality in our community," the organization said. Keyes said she did not know Flood personally but saw the impact the teen’s death had on the community. “I watched as children poured into the streets on the night they learned she was killed and cried into the early morning,” she said. The city council will vote Monday at 4:30 p.m.